The voice of a generation returns to Rio de Janeiro LIVE at Barra Music on October 23! A formidable member of the Tropicalismo movement that transformed Brazilian popular music during a time of extreme censorship, Caetano is well-recognized worldwide for his mesh of traditional Brazilian influences, avant-garde experimentalism, and being among the first Brazilian musicians to incorporate Rock n Roll. Alongside contemporaries such as Gil Gilberto, Os Mutantes, and even Frank Zappa, few would consider him anything other than one of Brazil’s finest musical gems! Price of tickets range from R$ 20 – R$ 300 and can be viewed at the link above. Casa Cool Beans opened in December 2010 and in less than 6 months rocketed up to the top of Trip Advisor so I was anxious to see what was so good about the place! It wasn’t difficult. Starting from the warm reception at the front gate you get the feeling that this is a place you want to be, where you are amongst like minded people in the heart of a city, but still have the peace and quiet and friendliness which comes with being in a small community. There are seven suites at Cool Beans at present (with 2 more planned for the New Year) and each one has been beautifully refurbished with decoration by local artists and artisans under the watchful eye of American owners Lance and David and the ever accompanying dog, Mousse. Walk up the steps and you are surprised by a large terrace with communal breakfast area and bar and great plunge pool for those hot sultry days. However the real difference of this place comes in the detail. 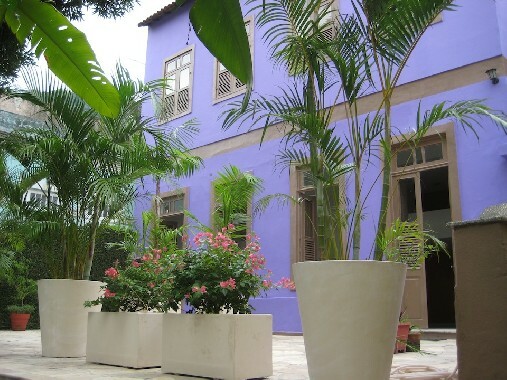 Even before you arrive at Cool Beans you get an email telling you what will be on in Rio during your trip and when you get to the pousada you will find a whole host of other suggestions as well. Nothing appears to be too much trouble to arrange, although you might just find that the best option is sometimes what we did- forget it all and chill by the pool with a book and a super cool glass of local champagne. Alison is an expert in Brazil travel and the inspiration behind Hidden Pousadas Brazil– a handpicked selection of some of the most wonderful pousada accommodation in Brazil – boutique hotels, guesthouses, inns and B&Bs. She has lived and worked in Brazil for over 30 years and is here to give you insider tips and advice on travelling in Brazil – where to visit, what to do, and where to stay. So what exactly IS a pousada? Click here to see the video!